Galina Murzakayeva, a coordinator for NGO Kolybel Nadezhdy, opening a baby box in Kirishi, an industrial town of 50,000 located 100 kilometers east of St. Petersburg. A box in which parents can leave their babies anonymously without any legal risk opened last month in a town in northwestern Russia, part of an effort activists hope will save many young lives. The baby box in Kirishi, an industrial town 100 kilometers east of St. Petersburg, is the 10th such facility in Russia. Experts think that’s just a fraction of what is needed. “Even if only one child is saved that way, it will be worth it,” said Tatyana Sobolevskya, deputy chief of the maternity department of Kirishi’s hospital, site of the baby box. Once a baby is put in the box, its door closes and a nurse is alerted by a signal. There are no security cameras, so parents can leave their babies anonymously. An information stand next to the box appeals to parents to think over their decision and offers contact numbers for assistance. 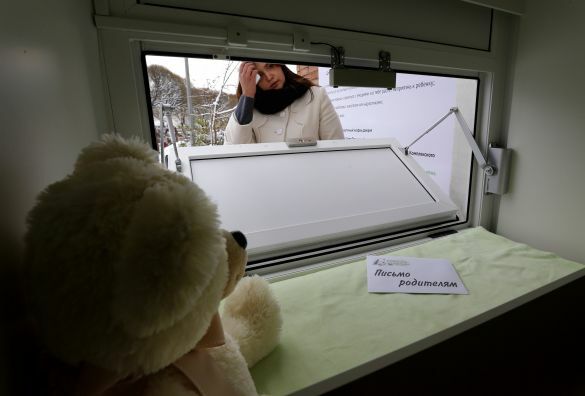 Kolybel Nadezhdy (Cradle of Hope), a nongovernmental organization that opened the baby box, said it should help attract nationwide attention to the issue. Its head, Yelena Kotova, said more than a dozen babies are abandoned in Russia every month, according to official statistics, but she said the real figures are believed to be at least three times higher. Russian police registered 268 cases of murder of newborn babies by their mothers in 2010 and 2011, and Russian media have carried regular reports of babies found in garbage containers, forests or snowdrifts. One of the most recent cases was in St. Petersburg in August, when a man found a 3-day-old baby in a plastic bag in the bushes. The boy survived and was soon adopted. Kotova said that in her hometown of Perm, in the Ural Mountains, the bodies of two newborn babies were found on a balcony. A woman who lived there with her other children just felt unable to raise another child, she said. In July, a 5-day-old girl was left in a baby box in Perm with a note giving her name, Margarita, and her date of birth. Two more babies were left in baby boxes organized by the Krasnodar region. Russia borrowed the baby box idea from other European countries, where they have become quite numerous in recent years but have also fueled heated discussions. Critics say they infringe on the rights of mothers and children.